Leaving 2015, we left a year marked by increased violence, the spread of drug addiction throughout Greater Milwaukee, and heightened racial tensions…still I am hopeful. I know this may seem counter-intuitive, but I will explain. When we examine our lives, we see that real change usually takes place only when we become tired of dealing with our current situation. I despise going to the dentist. But I know that it is the place I can go to get preventative care and help when I have tooth pain. When I get a cavity, I usually sit around for as long as I can stand the pain. But eventually, when I can stand the pain no longer, it doesn’t matter what my schedule looks like that day or who needs my attention. When that pain gets unbearable, I’m heading immediately to the dentist. I’m not saying that it is the best way to go about things. But this is also human nature. When it gets bad enough, people get desperate for change. Some city issues are made worse because of racial segregation. When you have certain areas that fight against new bus routes that would give access to jobs or others that choose to stay around people that look just like themselves to be comfortable, it impacts everyone. Any of these and more can touch us all as we consider the far reaching effects of an area divided. WHERE DOES THE CHURCH COME IN? As a follower of Jesus, I do Him a disservice if I stand by in silence, while others around me perish with little to no help. As someone that says that I believe in God’s power to change things, who am I not let that truth be lived out by my actions? Segregation that is motivated by fear or not being concerned for someone different than yourself will not help our city. If many of the churches in the Greater Milwaukee area are separated by race (And they are), is there racism in our churches? Is separation of races in Greater Milwaukee churches only based upon where people happen to live? Do people that don’t follow Jesus have a valid concern if they look at Christians and say…why would I want to follow Jesus if His followers are as racist as we are? Maybe the pain hasn’t gotten real enough for everyone to care. But I am hopeful that in 2016, more people will to make steps to build meaningful relationships with other races so we can better address the issues we face in Greater Milwaukee. 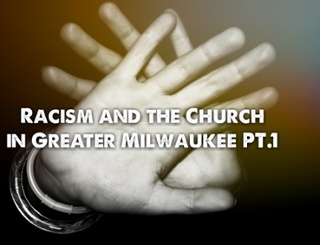 For part two of Racism and the Church in Greater Milwaukee, I will discuss reasons why different ethnicities may not feel comfortable in many churches.